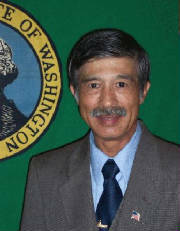 John W. Aiken, Jr. is campaigning for Governor of Washington state in the 2008 Election as a Republican candidate. Mr. Aiken was a candidate in the 2004 Election and lost in the Republican Ballot Primary to Mr. Dino Rossi. More information about him and his campaign platform can be viewed at www.myspace.com/johnwaiken. A slideshow of his numerous awards, certificates, and organization memberships can be viewed at www.myspace.com/johnaiken2008. Based on his extensive education, experience and background, Mr. Aiken believes that he is a more viable candidate than any running for this office. He also believes that he best represents the majority of voters and feels voters are more likely to identify with him than those opposing him. As the 2008 Election Day approaches, it will be clear to voters that he is the best person for the office. The reason why the other candidates have to spend so much money to convince voters that they are the better person is due to their own weakness in education and lack of real world experience. Those same candidates have provided too little in-depth information on the lion's share of their positions. Management of the major parties knew this and had to spend millions to prop up their candidate's weak backgrounds. This included exclusionary tactics against other more viable candidates in their own parties. This practice is continuing in the 2008 Election, but Mr. Aiken plans to cause a grassroots movement to tip this in his favor. In the course of his campaign, voters will find that not only does he have better and more innovative solutions to the challenges that our state faces, but they're more financially sound. More on John Aiken.